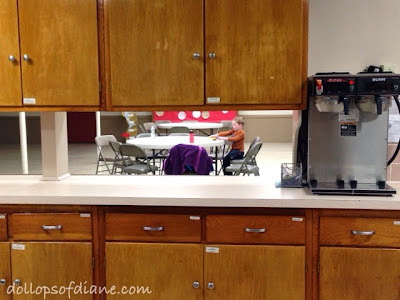 Starting last month, every Monday morning after I drop off Henry at pre-K, I'm in charge of cleaning our church's kitchen. As always, Daniel is my companion and my "helper." At first, I wasn't sure how he would do because as any mom knows - three year olds are the least helpful helpers around. However, I've found that over the past few weeks I've been pleasantly surprised with his behavior. Of course, I'm no fool so I have an arsenal of snacks and toys that I bring to keep him occupied.